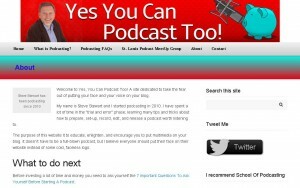 Yes You Can Podcast Too! The purpose of this website it to educate, enlighten, and encourage you to put multimedia on your blog. It doesn’t have to be a full-blown podcast, but I believe everyone should put their face on their website instead of some cold, faceless logo.